1.9 How To Apply For WBHRB Facility Manager Recruitment 2019? 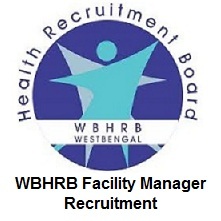 WBHRB Facility Manager Recruitment 2019: The higher officials of West Bengal Health Recruitment Board (WBHRB) had released the notification to fill 819 Facility Manager, Grade III Posts. Candidates who are interested in Facility Manager Grade III Posts, they can check the details of West Bengal Health Recruitment Board Notification 2019 which were mentioned below. Candidates who are searching for Jobs, they can utilize this chance right now. And they can apply for WBHRB Facility Manager Recruitment 2019 from 14th February 2019 to 25th February 2019 through online, and no other mode will be accepted. For more details of www.wbhrb.in Openings 2019, check this entire article. We have noticed that a large number of candidates are searching various websites on the internet for West Bengal Health Recruitment Board (WBHRB) Recruitment 2019. So, for that purpose, we had arranged this article for the comfort of applicants. The selection process is done by West Bengal Health Recruitment Board Other information like educational qualification, application fee, salary details and age limit are given below. Before applying for this WBHRB Facility Manager Recruitment 2019, aspirants must and should have to know the information of educational qualification. In the below section, we had mentioned the details about educational qualifications which are correct and accurate. All information regarding selection/ recruitment (date of examination, date of interview etc.) to the post will be available, time to time in the Board Website at www.wbhrb.in. Applicants who are interested to work in these jobs, they can see the below section because we had clearly mentioned the details of post-wise vacancies in this section. And you can also check the official web site for West Bengal Health Recruitment Board (WBHRB) that is www.wbhrb.in. All selected candidates can get the hand full payment for these posts. Rs.7100/-Rs.37600/- (Entry Pay Rs. 7,440/-) with Grade Pay Rs. 3,600/- ( Pay Band 3 of ROPA 09 Rules ) Other allowances shall also be admissible as per existing Government Rules. Candidates must submit online the application fee amounting to Rs. 160/- (Rupees one hundred & sixty) only through GRPS ( Govt. Receipt Portal System ), Govt. of West Bengal under the Head of Account ‘0051-00-104-002-16’. Money Order, Cheque, Bank Draft, Cash etc. shall not be acceptable. No application shall be considered unless accompanied by the requisite application fee. Candidates must follow the below section that is age limit for these posts. How To Apply For WBHRB Facility Manager Recruitment 2019? In that, you can see many features are there than you can see the recruitment section which is at the right of the home page. Again you can see the advertisement section in the recruitment section. Next, you can search for the WBHRB Facility Manager Recruitment 2019 link. Thoroughly understand all the details in the WBHRB Facility Manager Recruitment 2019 Notification. After reading the notification, if you are eligible then apply application form through online, and also pay the fee. Fill the details present in the application form. Take two or more hard copies of WBHRB Facility Manager Recruitment 2019 Application Form for further usage. For more information regarding WBHRB Facility Manager Recruitment 2019, applicants can keep visiting Sarkari Naukri. From our site, they can also get more info such as of admit cards, results, syllabus, previous papers, and latest recruitment notifications of state and central government jobs. Applicants who are having queries, they can comment us in the below section. Thank you.